Go to original pattern for design DROPS 175-2. Size: S - M - L - XL - XXL – XXXL - read MEASURING TIP. DROPS CIRCULAR NEEDLE (60 or 80 cm / 24'' or 32'') SIZE 9 mm/US 13 – or size needed to get 10 stitches and 18 rows in garter stitch = width 10 cm / 4'' and height 10 cm / 4''. See diagram A.1. Diagrams show all rows in pattern seen from the right side. Choose diagram for your size. 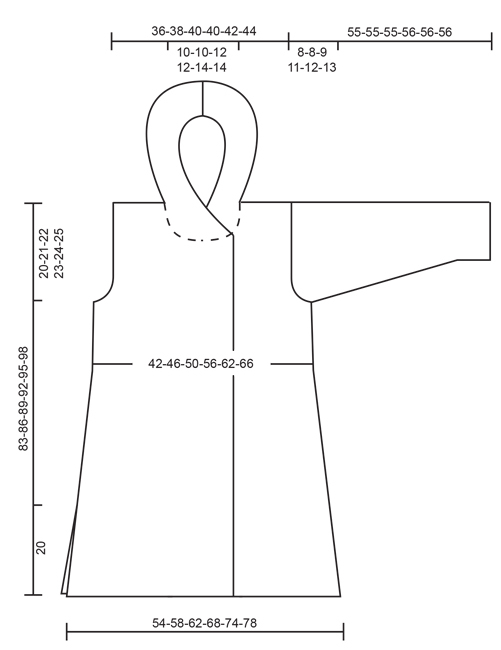 All length measurements are done when piece is held up, otherwise the jacket will be longer than measurements in chart when worn. This is important because the texture will make the garment longer. Decrease inside 3 edge stitches in garter stitch in each side by knitting 2 stitches together. All decreases are done from the right side. Increase 1 stitch inside 2 edge stitches in garter stitch in each side. 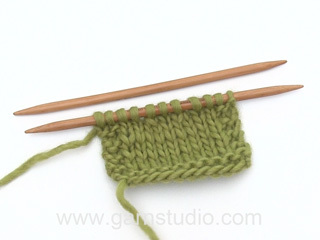 Increase 1 stitch by making 1 yarn over, on next row knit yarn over twisted to avoid holes. To calculate how to increase evenly, use the total number of stitches on row (e.g. 56 stitches), minus 16 band stitches in each side and divide the remaining stitches by number of increases to be done (e.g. 24) = 1.6. In this example increase after alternately approx. every and every other stitch. 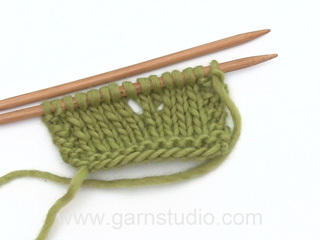 Increase 1 stitch by making 1 yarn over, on next row knit yarn over twisted to avoid holes. Worked back and forth on circular needle in parts and sewn together when finished. Cast on 54-58-62-68-74-78 stitches on circular needle size 9 mm / US 13 with 2 strands light sea green. 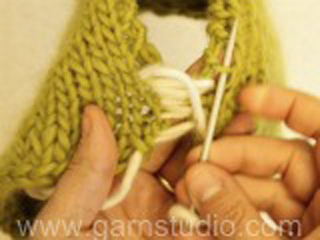 Remove one strand and work in GARTER STITCH - see explanation above. REMEMBER THE KNITTING GAUGE When piece measures 14-15-16-17-18-19 cm / 5½''-6''-6¼''-6¾''-7''-7½'' - READ MEASURING TIP, work STRIPES as shown in A.1. AT THE SAME TIME when piece measures 24 cm / 9½" in all sizes, decrease 1 stitch in each side - READ DECREASE TIP (= 2 stitches decreased). Decrease like this every 7-7-7-8-8-8 cm / 2¾''-2¾''-2¾''-3 1/8''- 3 1/8''- 3 1/8'' 6 times in total in each side = 42-46-50-56-62-66 stitches. When diagram A.1 has been worked, continue with off white until finished measurements. When piece measures 63-65-67-69-71-73 cm / 24¾''-25½''-26 3/8''-27 1/8''-28''-28¾'' - remember MEASURING TIP, bind off for armholes at the beginning of every row in each side as follows: 3 stitches 0-0-1-1-1-1 time, 2 stitches 1-1-0-1-2-2 times and 1 stitch 1-2-2-3-3-4 times = 36-38-40-40-42-44 stitches. Continue to work until piece measures 81-84-87-90-93-96 cm / 32"-33"-34 1/4"-35½"-36½"-37 3/4". Now bind off the middle 8-8-10-10-12-12 stitches for neck and finish each shoulder separately. Bind off 1 stitch on next row from neck = 13-14-14-14-14-15 stitches remain on the shoulder. Work until piece measures 83-86-89-92-95-98 cm / 32 3/4"-34"-35"-36 1/4"-37½"-38½" – remember MEASURING TIP and bind off with 2 strands off white (this is done to avoid a tight bind-off edge). Work the other shoulder the same way. Cast on 43-45-47-50-53-55 stitches (including 16 band stitches towards mid front) on circular needle size 9 mm / US 13 with 2 strands light sea green. Remove one strand and work in garter stitch. When piece measures 14-15-16-17-18-19 cm / 5½''-6''-6¼''-6¾''-7''-7½'', work stripes as shown in A.1 the same way as on back piece. When piece measures 24 cm / 9½'' in all sizes, begin decrease in the side and decrease the same way as on back piece = 37-39-41-44-47-49 stitches. When piece measures 63-65-67-69-71-73 cm / 24¾''-25½''-26 3/8''-27 1/8''-28''-28¾'', bind off for armholes at the beginning of every row the same way as on back piece = 34-35-36-36-37-38 stitches. When piece measures 77-80-83-86-89-92 cm / 3/8''-31½''-32¾''-33 7/8''-35''-36¼'', slip the outermost 17-17-18-18-19-19 stitches towards mid front on 1 stitch holder for neck (work them before slipping them on stitch holder to avoid cutting the yarn). Continue to bind off for neck at beginning of every row from neck as follows: 2 stitches 1 time and 1 stitch 2 times = 13-14-14-14-14-15 stitches remain for shoulder. Work until piece measures 83-86-89-92-95-98 cm / 32 3/4"-34"-35"-36 1/4"-37½"-38½"– remember MEASURING TIP and bind off with 2 strands off white. Cast on and work as right front piece but with decreases in the opposite side. Cast on 20-22-22-24-24-26 stitches on circular needle size 9 mm / US 13 with 2 strands off white. 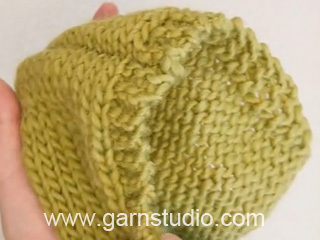 Remove one strand and work in garter stitch back and forth. When piece measures 10 cm / 4'', increase 1 stitch in each side - READ INCREASE TIP-1! Increase like this every 5-5-4-3½-3-3 cm / 2"-2"-1½"-1 1/4"-1"-1" 8-8-9-10-11-11 times in total = 36-38-40-44-46-48 stitches. When piece measures 47-47-46-45-44-43 cm / 18½"-18½"-18"-17 3/4"-17 1/4"-17", bind off for sleeve cap at beginning of every row in each side as follows: 3 stitches 1 time, 2 stitches 1-1-2-2-2-2 times and 1 stitch 3-3-3-5-6-7 times. Then bind off 2 stitches at beginning of every row in each side until piece measures 54-54-54-55-55-55 cm / 21 1/4"-21 1/4"-21 1/4"-21½"-21½"-21½". Bind off 3 stitches at beginning of the next 2 rows before loosely binding off the remaining stitches with 2 strands off white. Entire sleeve measures approx. 55-55-55-56-56-56 cm / 21½"-21½"-21½"-22"-22"-22" from top and down. Make another sleeve the same way. Sew the shoulder seams. Sew in sleeves. Sew underarm seams and side seams in one - sew in outer loops of edge stitches to avoid a chunky seam, but leave approx. 20 cm / 8'' at the bottom of each side of front and back piece for vents. Pick up from right side approx. 56 to 68 stitches around the neck (including stitches on stitch holders at the front) on circular needle size 9 mm / US 13 with off white. Work in garter stitch back and forth and increase AT THE SAME TIME evenly to 80-82-84-86-88-90 stitches on first row – READ INCREASE TIP-2 (do not increase over the outermost 16 stitches in each side). When hood measures 35-35-36-36-37-37 cm / 13¾''-13¾''-14¼''-14¼''-14½''-14½'', loosely bind off with 2 strands off white. 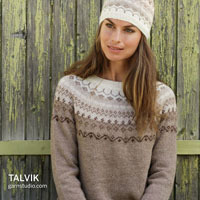 Place hood double and sew together at the top with grafting/kitchener stitches. The jacket has 4 ties, 2 ties in 2 strands off white and 2 strands in 1 strand off white + 1 strand light sea green. 1 tie = cut 2 strand of approx. 2.8 meters/3 yds. Twine the strands tog until they resist, fold the strands double so that they twine. Tie a knot in each end (string should be approx. 1 meter/1.2 yds when finished, cut it to correct length if needed). Fasten 1 tie in off white + light sea green on the outside on the left side of jacket approx. 2 cm / 3/4'' below armhole (try the jacket on and adjust placement of string). The other tie with off white + light sea green should be fastened to the edge of right front piece approx. 22-23-24-25-26-27 cm / 8 3/4''-9''-9½''-9 3/4''-10 1/4''-10 5/8'' from shoulder and down. Fasten 1 tie in off white approx. 2 cm / 3/4'' below armhole on the inside of jacket in right side. The other tie in off white should be fastened at the other at the edge of left front piece approx. 22-23-24-25-26-27 cm / 8 3/4''-9''-9½''-9 3/4''-10 1/4''-10 5/8'' from shoulder and down. Dear Fi, you will find the required total amount of each colour under the header, ie in size XXXL you require 450 g off white / 50 g a ball Melody = 9 balls off white + 200 g light sea green/50 a ball Melody = 4 balls light sea green. Happy knitting!